HCA Healthcare's Monday announcement that its top executive plans to retire at the end of the year came as no surprise to Wall Street analysts. It's par for the course at the for-profit hospital chain, which they say has made a practice of refreshing its CEO post every handful of years. Another piece of news that didn't seem to turn heads: R. Milton Johnson's replacement, Sam Hazen, whom analysts described as the "logical" and "natural" successor. 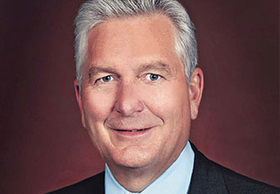 Once Johnson closes out his five-year tenure as CEO on Dec. 31, 2018, Hazen, currently the company's chief operating officer, will step into the role. Analysts said Hazen, a prominent voice on the company's investor calls, was the obvious pick for the top job, given his proximity to the company's most important decisions in recent years. "The investment community thinks pretty highly of Sam," said Jason Plagman, a healthcare analyst with Jefferies. Ed Fishbough, a spokesman for HCA, wrote in an email that the company does not have an established practice of replacing its CEOs after a certain number of years. Johnson's predecessor, Richard Bracken, also served in the post for five years, but Jack Bovender Jr. served eight years before that. Florida Gov. Rick Scott served as the company's CEO until 1997, when he resigned amid a federal investigation into alleged kickbacks and Medicare overbilling that the company ultimately settled for $2 billion. Johnson, who joined HCA 36 years ago, has served as CEO since Jan. 1, 2014. Before that, he was HCA's chief financial officer from July 2004 through December 2013. Prior to that, he was the company's controller and vice president. HCA made the retirement announcement before the markets opened on Monday. By market close, the company's share price had dropped by 0.73% to $131.50. Under Johnson's watch, HCA has focused intensely on multiplying its ambulatory access points to capture volume even as patients continued to slip through hospitals' fingers. HCA has become known for its success in capturing the No. 1 or No. 2 spots in the markets it serves. Ana Gupte, managing director of healthcare services with Leerink Partners, said HCA has simply done a better job than its competitors of deploying capital in a balanced way, both in hospital markets that have inbound population growth and ambulatory sites such as urgent-care clinics, free-standing emergency rooms and free-standing cancer centers. HCA has set a goal of having 2,000 ambulatory surgery centers by 2020, compared with about 70 at the beginning of 2017. "They've just created a very, very powerful platform that, despite the fact that there's been a lot of headwinds in the hospital sector, they are a leader in these markets and they have been able to continue to grow both top-line and bottom-line across steady and consistent execution with volume growth and pricing growth," Gupte said. Johnson frequently made Modern Healthcare's annual list of the Top 100 Most Influential People in Healthcare, including this year's list released last month, in which he took the No. 14 spot. Johnson's total compensation was $17.3 million in fiscal 2017, although much of that was in stock awards and other benefits. He'll be 62 when he steps down. Jefferies' Plagman agreed that Johnson is known for prioritizing expanding HCA's footprint through an accelerated capital expenditure program during his time as CEO, an important move that's starting to show up in the company's strong financial results year-to-date. In July, HCA beat key Wall Street earnings expectations when its net income jumped 25% to $820 million in the second quarter of 2018. Same-facility admissions increased 2.7% during the quarter, and outpatient surgeries increased 2.6%. "I think that's been one of the things that Milton will likely be remembered for–that acceleration in their capital spending to expand their presence in existing markets," Plagman said. In a statement released Monday, Johnson touted the fact that HCA has grown its revenue from $34.2 billion in 2013 to $43.6 billion in 2017, invested approximately $13 billion in capital expenditures, returned more than $10 billion in cash to shareholders through share repurchases and dividends and increased its stock price more than 275%. "I remain excited about the company's future and have strongly endorsed Sam as the right person to lead the company," Johnson said. "His leadership has greatly contributed to our success." HCA, which may soon expand into North Carolina with the $1.5 billion pending acquisition of six-hospital, not-for-profit health system Mission Health, did not make its leadership available for comment. Hazen was appointed a member of HCA's board of directors on Monday, bumping the total number of directors to 12. He's been with the company for almost 36 years, including as its Western Group president and Western Group CFO. His total compensation was $9.5 million last year. "We are committed to providing our patients with the best possible care," Hazen said in a statement. Johnson has been a director at HCA since 2009. He'll keep his board chairman post through the company's annual shareholders' meeting in April 2019. At the meeting, the board is expected to appoint Thomas F. Frist III, a current board member, to chairman. He's the son of HCA founder, Thomas Frist Jr. and has been on HCA's board since 2006. The Frist family owns about 20% of HCA's outstanding shares.